Colca Canyon, one of the deepest canyons in the world, is another beautiful attraction in Peru. I’ve heard it’s the deepest.. the second deepest in the world..not really sure which but it’s deep (10,275 ft/3,270m deep = almost 2x deeper than the Grand Canyon). 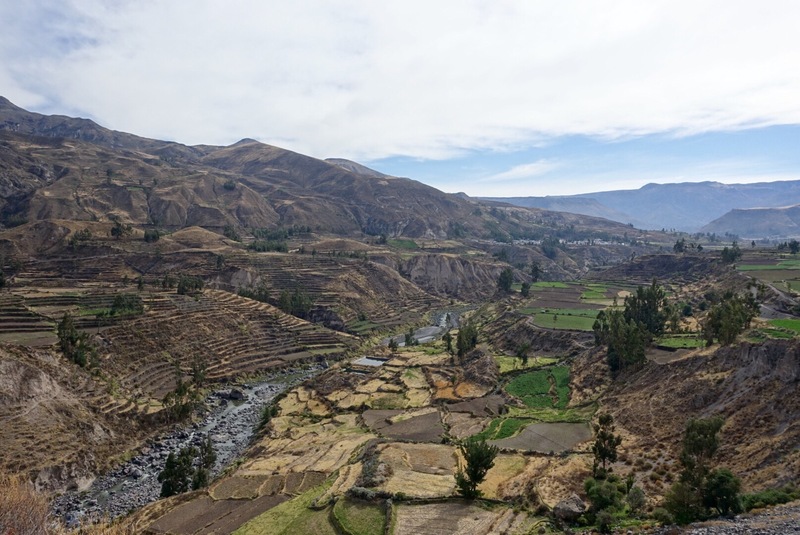 What’s cool about this area is that agriculture still makes up 70-80% of the economy (the rest is tourism of course) and they still farm using the stepped-terraces used by pre-Incas. The other thing people come to see here are condors. I didn’t understand their significance until I got here. Apparently, they are a national symbol for many South American countries and the actual national bird for a few of them. As we learned from our Machu Picchu guide, in Andean mythology, they were the rulers of the upper world. They symbolize health and power. Also, they’re endangered. Other than that, they’re just really big birds! We saw one pretty close up! We also went to the La Calera hot springs. Kind of disappointing for hot springs…have seen much better…everywhere else. I can say this is the first time I’ve gone to the hot springs outside in super hot weather. We also went to the mirador de volcanes which is a viewpoint where you can see a six volcanoes. The downside is that this place was at 4,860 meters (15,944 ft). The entire bus was passed out. This was a really cool tour. A full day starting at 3am (yes, middle of the night am) and ending at 6pm. Pretty exhausting but definitely saw a lot!